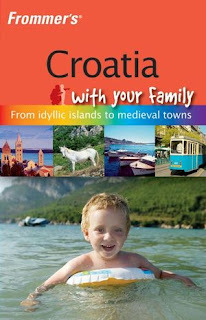 This book is all the more valuable for the fact that Croatia has yet to overtly target the childrens’ tourism market. We’re hard pushed to think of a single theme park, water or otherwise. A little more common are childrens’ playgrounds and wooden horses on springs, nailed to the floor on ferries. In Croatia, children play safely like our parents used to, without too much need for expensive gismos and theme parks – in the sea, on the beach, often in quiet back roads and normally under careful supervision. The family unit, often including a vast extended family, is strong, and children are adored and well cared for. They’re not, however, fussed over or restricted, like their western European peers, under mounting EU health and safety regulations, and genuine concerns for their security. You may be shocked to see the occasional five year old on a motor bike, in between his mum and dad, with no crash helmets anywhere in sight, and it’s not altogether legal, but everyone’s happy and the village traffic is not quite what you’d get in England. Above all, Croatia is a safe country, with very low crime rates, particularly outside the big cities. So for those who are wondering whether Croatia is the right place for the next family holiday, and not sure where to go or what to do, Croatia With Your Family is for you. For more details, including where to buy it, go to http://www.frommers.com/uk/withyourfamily/. Having last visited Croatia before the break up of the Yugoslav Republic, the author is a self confessed born-again Croatia enthusiast. Use his experiences, and those of his family, to plan and execute your holiday, and the whole family will probably fall in love with Croatia too.